Whatever you think of the possibility of a computer painting a portrait, composing a symphony or writing a novel, it’s certain that Artificial Intelligence is going to affect the online world. Neural networks, generating and comparing millions of variations against preset examples, can certainly produce something which could be mistaken for human art, music or writing – but while repetitive, data-driven jobs may be threatened by rampant AI, surely creative endeavours are not about to be challenged by the machines? Well, maybe, maybe not. As the capabilities of AI evolve, there may be exponential improvements in their abilities, and this may well apply to areas such as online content creation. In an article published in The Guardian earlier this year, Jonathan Holmes wrote about AI in journalism which was a bit of an eye opener for me. 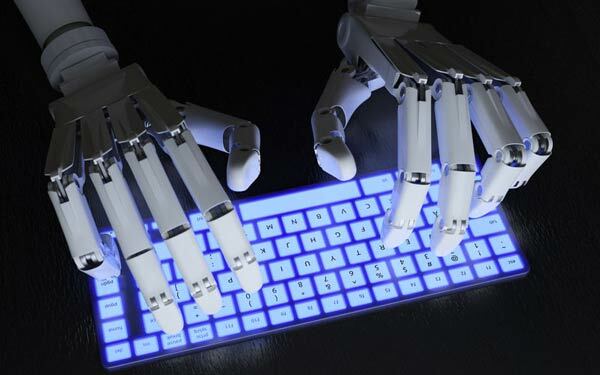 Recent advances mean that AI can now write readable, flowing copy, and churn out repetitive articles faster than the most caffeinated hack. one2one Digital spends a laborious amount of time researching data, keywords, demographics etc. to be able to deliver great content of different lengths for various uses, predominantly for SEO purposes. Content is still King no matter how you boil it down and the search algorithms are excellent at reading that content which we all know has a direct effect on SERP. With Google’s acquisition of DeepMind in 2014 I would believe that they are far beyond others in the arena of actual AI development. They have amassed an overwhelming amount of R&D in the process and development of algorithm technology and vast live testing ability; combine their unlimited tech capacity and almost unlimited resources with some of the best and brightest minds and you have a clear recipe for success. They have been methodically bringing stand-alone algorithms under the core algorithm which implies that it is learning and developing, the latest being Penguin (as far as we’re publicly aware at least). Self-programing (aware) algorithms? Probably to a degree. I do not see us reducing our editorial staff anytime soon but all of us involved with strategy, looking to get the best results for our clients, can readily see the huge implications this will have on content and how it will be served up dynamically and in almost real-time. It would appear that we are not far off one algorithm feeding another and being able to anticipate how to react. Eventually we will have an elite company or organizations with the ability to start producing AI content which is precisely tailored to search algorithms. In theory, the AI will learn as fast as and be able to anticipate the SERP algorithm. Will this render rich, dynamic content creation futile? We are not quite at the Skynet level yet, but it is food for thought as the technology is here. I am a bit on the fence about this as it is not just ranking of someone selling through their online store but also Social ranking, Blog ranking, news ranking. AI content creation could predict how and when to produce news worthy content based on social threads, search criteria and other live sources and produce content, be it true or false, to sway opinion or plant ideas. I am certainly not a conspiracy theorist but given the recent upheavals with Facebook and bogus news content we can see a dangerous trend. Perhaps it will be a unique future selling point for one2one Digital that we have actual people producing content for our clients. From a technical points of view, the ability of AI to produce online content may be exciting and cool – but there’s always the suspicion that it may lose something from a lack of human input. As digital marketing develops and evolves, you must be constantly learning new techniques and technologies – but never forget that as with traditional marketing, you shouldn’t lose sight of ethical practice. Automated AI content may have a lot to offer, but in this brave new world, who will stick up for the rights and abilities of the mere human? © 2012 - 2019 one2one Digital Ltd. All rights reserved.